While birthday cupcakes and Halloween candy have been long-held and popular traditions in many schools, it's becoming increasingly common for schools to institute a "no food" policy for birthday and other classroom celebrations. Some of the possible reasons for instituting a no food policy include protection for students with food allergies in the classroom and overall healthy eating and exercise programs implemented by school districts. Many parents like no food policies since they help children with food allergies who might otherwise be left out of classroom celebrations and can help to combat the growing problem of childhood obesity. If your school does not allow food in classroom celebrations, or if you would like to start this trend yourself, the following ideas can help you brainstorm non-food ways to celebrate a child's birthday at school. These ideas can help teachers develop a plan to celebrate birthdays without food in the classroom. If you're a parent who's interested in promoting a no food policy in the classroom or in the school, these could help you show your child's teacher what's possible. 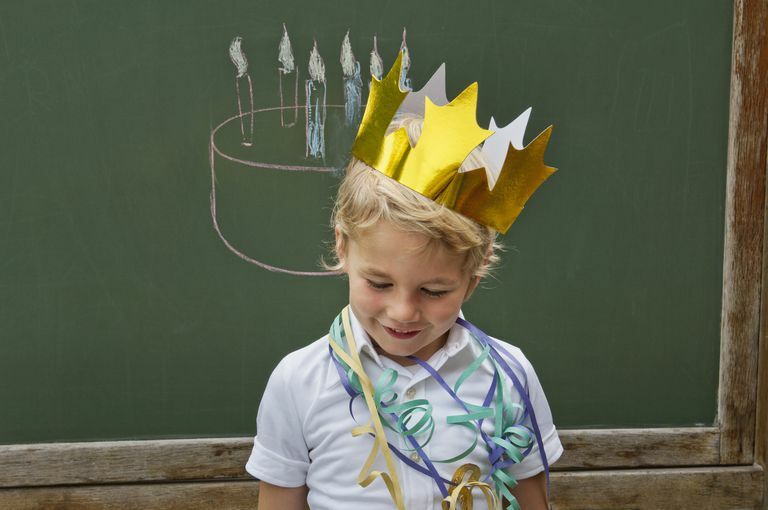 Allow the birthday child to be "queen" or "king" for the day—give them the leadership role of line leader, calendar helper, feeder of the class fish, or keeper of the chalkboard. Read the birthday child's name with the morning announcements and give the child a birthday ribbon to wear. Have the class decorate a card to be presented to the birthday child. Have a special birthday crown that the child can wear for the day. This can be a hat that stays in the classroom or a simple paper crown that goes home with the child. Host a special monthly birthday lunch club with the teacher (with each child's regular lunch). Give the child a coupon redeemable for something fun in the classroom, like extra art time or a "get out of homework free" pass. Bring in stickers, pencils, fun erasers, or inexpensive toys such as stretchy frogs or plastic tops for the class. Donate a plant to beautify the school grounds, such as flowers, bulbs, trees, or bushes. Donate a board game to be used for indoor recess or a sturdy jump rope or ball for outdoor games. Have a family member come to class to read a story or share a special talent or skill, or allow the child to share their talent with the class. Work with your child's teacher to plan (and possibly fund) a special art project in honor of your child's birthday. For Halloween, plan a costume day and parade. In lieu of food-based Halloween treats, have parents send in small toys or decorated pencils. Stretchy animals such as lizards and dinosaurs often are huge hits with both boys and girls. You also can consider small, colorful bouncing balls, glitter rings, and plastic stamps. For the winter holidays, decorate ornaments that the children can take home. Plan a "Secret Santa" activity with small gifts (this can stretch over several days). Parents and teachers who advocate for a no food school policy may face some opposition from other parents. Food is a huge part of our culture, and some parents enjoy cooking for the classroom. In addition, it can be easier for busy parents to buy a large bag of candy or decorated cupcakes than to try some of the above ideas. However, if parents and the school are committed to making a no food policy work for everyone, it can be an enriching experience for everyone involved. Center for Disease Control and Prevention. Voluntary Guidelines for Managing Food Allergies in Schools and Early Care and Education Programs. October 2013.